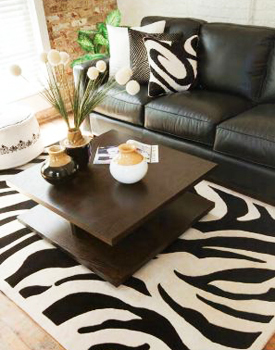 Area Rugs add warmth and style to any room in your home or office. Deciding what size rug to purchase can seem like quite a task, but with a little planning and measuring, you can purchase the perfect area rug for your room. Arrange your furniture before determining the size of a new area rug. It generally makes a room look more pulled together for all of the legs of the furniture to be resting on a room sized area rug. It is also acceptable for the furniture to be arranged around the edge of the rug. All legs on, or all legs off is a good "rule of thumb" to keep in mind. Important: Measure the space you wish to cover with a tape measure to determine the size rug you need. Choose a rug that comes close to your measurements. In irregularly-shaped rooms, consider using a round rug. In a dining room, both the table and chairs should sit on the rug. The rug should be large enough that when the chairs are pulled out they remain on the rug. To measure: Pull all the chairs away from the table, as you would to sit down. Measure from the rear chair legs in width and length. Another option is to measure your table and add 48" to both measurements. When putting a rug under the bed, you should allow at least 18" to 36" to extend outside the bed's perimeter.